KANSAS CITY, May 2, 2018 – This summer, The Nelson-Atkins Museum of Art will present Unexpected Encounters (June 2 – August 12, 2018), an interactive exhibition showcasing the museum’s significant gifts over the past decade. The exhibition will provide rare insight into the museum’s inner workings and will offer new ways to engage with the collection. Featuring 250 works spanning the 16th to the 21st centuries, five continents and a broad range of disciplines—including painting, photography, ceramics, sculpture, furniture, and jewelry—Unexpected Encounters will challenge audiences to seek connections between a multitude of disciplines and consider new ways of thinking about art. The exhibition also will highlight some of the museum’s newer collecting initiatives of acquiring more works by women and artists of color. A product of intense collaboration between curators from every department, the exhibition aims to present dynamic and surprising juxtapositions that break the boundaries of traditional museum displays and reflect the Nelson-Atkins’ interdisciplinary approach to the display of art. Intriguing pairings will encourage visitors to consider commonalities between seemingly disparate works, such as Giovanni de Vecchi’s 16th-century drawing of a corpse alongside contemporary artist Olafur Eliasson’s conceptual sculpture of negative space formed by glacial ice melted within a concrete block, The Presence of Absence (Nuuo Kangerlua, 24 September 2015 #3). Interactive opportunities throughout the exhibition will allow visitors to understand a curators’ perspective when choosing works to acquire or mounting an exhibition. They will be able to reimagine virtual gallery spaces based on their own interpretations of aesthetic, temporal, geographic, or thematic relationships, as well as indicate which factors –rarity, historical relevance, or outstanding craftsmanship – affect the decisions to acquire art. Unexpected Encounters will feature several new acquisitions on view at the Nelson-Atkins for the first time, including Sean Scully’s Landline Tappan (2015) and an early 20th-century cabinet by Italian designer Carlo Bugatti. The exhibition will showcase a range of recently acquired works by American Indian contemporary artists including Navajo artist Norbert Peshlakai and master weaver Nellie Joe; Hopi painter and sculptor Dan Namingha; Northern Cheyenne multidisciplinary artist Bently Spang; Cochiti Pueblo potters Virgil Ortiz and Diego Romero; Cherokee painter Kay WalkingStick; and Crow multimedia artist Wendy Red Star. Other highlights from the sweeping exhibition include Romare Bearden’s Jazz 1930s – The Savoy (1964), South Korean artist Lee Lee-Nam’s digital video Early Spring Drawing-Four Seasons 2 (2011), a pair of Lakota gauntlets (ca. 1890), photography by Manuel Álvarez Bravo, Roy DeCarava, and Gertrude Käsebier; paintings by Emile Bernard, Ed Blackburn, Archie Scott Gobber, and Albert Bloch, sculptures by James Henry Haseltine and Tip Toland; works on paper by Kara Walker, George Copeland Ault, Miguel Rivera, and Jules Olitski; and decorative arts including a Christopher Dresser claret jug and umbrella stand, a frame by Archibald Knox, and jewelry by the late artist Marjorie Schick. More than 300 works of art throughout the museum that were acquired through the generosity of donors will be identified with a special gift icon on each object label. These include monumental works such as The Gates of Paradise, a promised gift from Paul DeBruce and Linda Woodsmall-DeBruce, Saint Adrian by Kehinde Wiley, a promised gift from John and Sharon Hoffman, and Still Life of Exotic Flowers on a Marble Ledge by 17th-century Dutch artist Rachel Ruysch, a gift from James and Virginia Moffett. This late 17th-century masterpiece featuring a host of exotic blooms has hung on loan in the European galleries since 1998, visited by the Moffetts every Sunday afternoon without fail. In 2017, they felt the time was right to officially donate this masterpiece to the Nelson-Atkins. Widely considered one of the most prolific still-life painters of all time, Ruysch’s technical virtuosity helped earn her the distinction of being the first woman admitted to the male-dominated guild at The Hague in 1701. 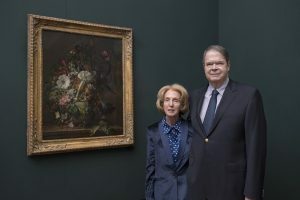 The exhibition will also celebrate the Nelson-Atkins longstanding support from Kansas City donors, including Barbara and Peter Gattermeier, Bill and Christena Gautreaux, and Mike and Linda Lyon, whose generous contributions have made the growth of the museum’s collection possible, as well as collectors from beyond Kansas City who have donated works to the museum. Absolut No Return, 2008. Hank Willis Thomas (born 1976). Chromogenic print, 95 1/2 × 47 7/8 inches. Gift of Shirley Bush Helzberg, 2018.3. © Hank Willis Thomas. Landline Tappan, 2015. Sean Scully, American (born Ireland, 1945). Oil on aluminum, 118 x 74 3/4 inches (300 x 190 cm). The Nelson-Atkins Museum of Art, Kansas City, Missouri. Purchase: acquired through the generosity of Sean Scully, Dr. Luther Brady in honor of Lee Lyon and the William T. Kemper Foundation—Commerce Bank, Trustee, 2017.46. 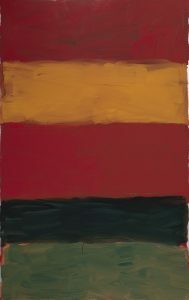 © Sean Scully. 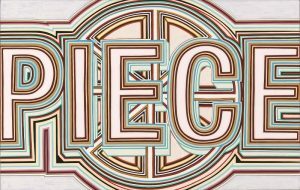 Piece, 2011. Archie Scott Gobber, American (born 1965). Enamel on canvas, 37 15/16 × 59 1/4 × 2 inches. Purchase: acquired through the generosity of the Beckett Art Purchases Fund in memory of Samuel and Ethel Beckett, 2017.63. © Archie Scott Gobber. Oil on canvas, 35 1/4 x 27 3/4 inches, Gift of James and Virginia Moffett 2017.62.